The country lost a legend on Friday with the death of Sgt. Maj. Henry Black, the service’s oldest surviving sergeant major of the Marine Corps. As noted in an obituary I wrote Monday, Black served in combat in both Korea and Vietnam, even earning a Silver Star for heroism as a junior Marine. SgtMaj Black was a stalwart Marine. I was privileged to spend time with him over the past 15 months. Last Monday I visited with SgtMaj Black, and all he wanted to talk about were the Marines in the fight and how they were holding up … their spirit, morale and welfare. He was talking and thinking about the Marines until his last breath. Like SgtMaj Kent, I valued and relied on SgtMaj Black’s wise counsel and breadth of experience. SgtMaj Black was a selfless servant leader … the Corps has lost a great Marine. In the photograph above, Barrett is seen this morning presenting the U.S. flag to Black’s family. 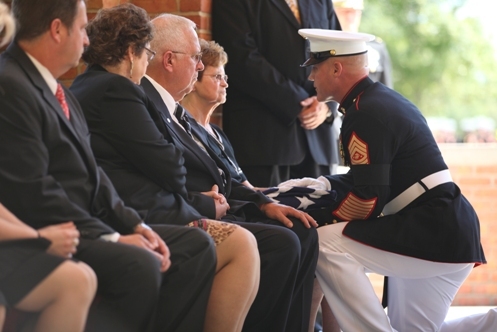 The sergeant major was buried with full military honors at Quantico National Cemetery. Sgt Maj Black was my mother’s brother. We came up from Florida for the service and it was such and honor to see the tribute from the Marine’s for one of their Sgt Majors. What a warrior. It’s serving under leaders such as Sgt Maj Black that I value most from the time I served. I didn’t serve under Black, but I believe there’s a bit of him that was handed down from generation to generation. Semper Fidelis, Sgt. Maj. Thank you for your service and example.